A shopping blog devoted to exceptional finds in fashion, jewelry, and home furnishings. One of my dreams is to someday own a home with a modern kitchen. I envision it to have all stainless steel and black appliances. I would love for it to have a large island in the center where food can be prepped while family and friends sit around chatting or our children do their homework. I see a row of at least four modern bar stools with either a chrome or pewter finish. 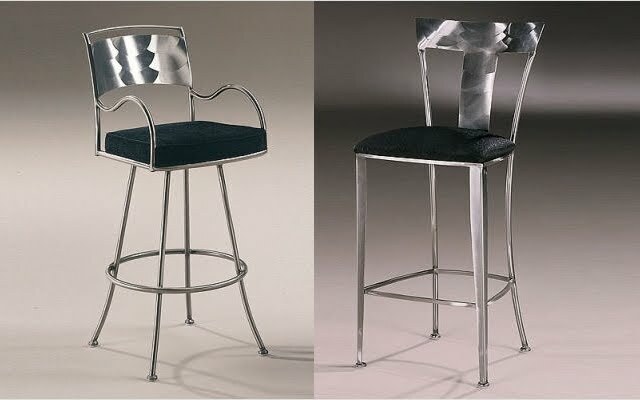 I have fallen in love with several all-metal bar stools. Although I love the look of them, I cannot help but wonder how comfortable they would be . . . not to mention they look and feel a little cold. Either of these two bar stools by Johnston Casuals would be an excellent compromise. The black would definitely work in my dream kitchen and there is enough pewter to still offer the cosmopolitan look I want. The Johnston Casuals Armada and Geode bar stools are offered with other metal finishes, as well as upholstery choices on AllModern.com . Pewter and black are my colors of choice. What would yours be? Although this is a sponsored Featured Products article, all thoughts expressed are those of the author's. Copyright 2019 A Blog of Goodies.